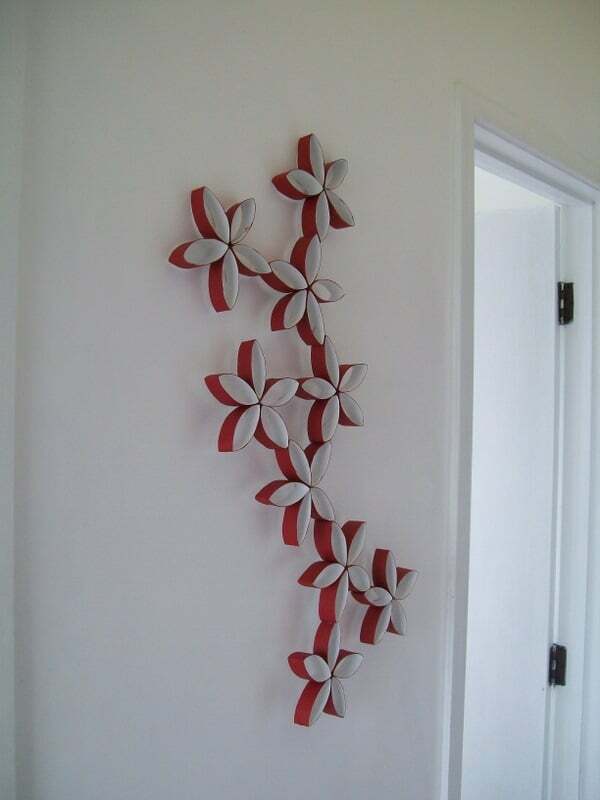 We’ve posted about unique wall decor before, but there are just so many amazing DIY options out there that it’s a topic worth covering again! This time, we’ve done our best to find you pieces that are even more exciting and unconventional than last time. 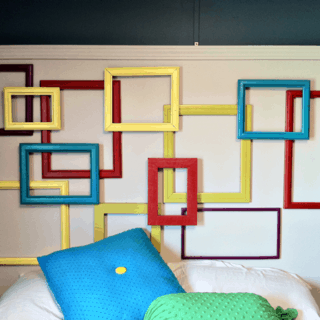 Check out these 15 wall art or display ideas that will really set your space apart from your friends’ home decor schemes! 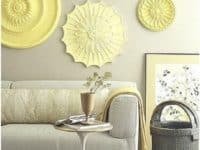 Apartment Therapy suggests using vintage Hot Wheels toys, cars leftover from your childhood, or models you’ve picked up at thrift stores and garage sales to create an eye catching and rather bright all display. It’s like creating a wall collage, but using toy cars instead of stickers or photos! 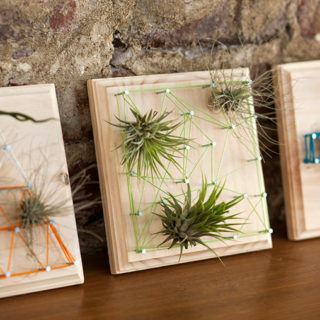 Bewolfsuggests making a flat wall mobile instead of simple wall art of a classic mobile that hangs freely from the ceiling. 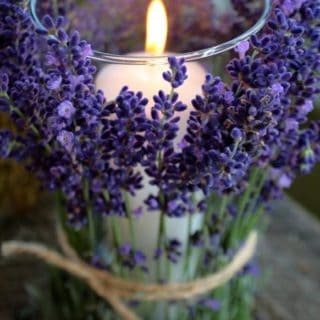 This adds a bit of subtle texture without distracting from the rest of your decor. 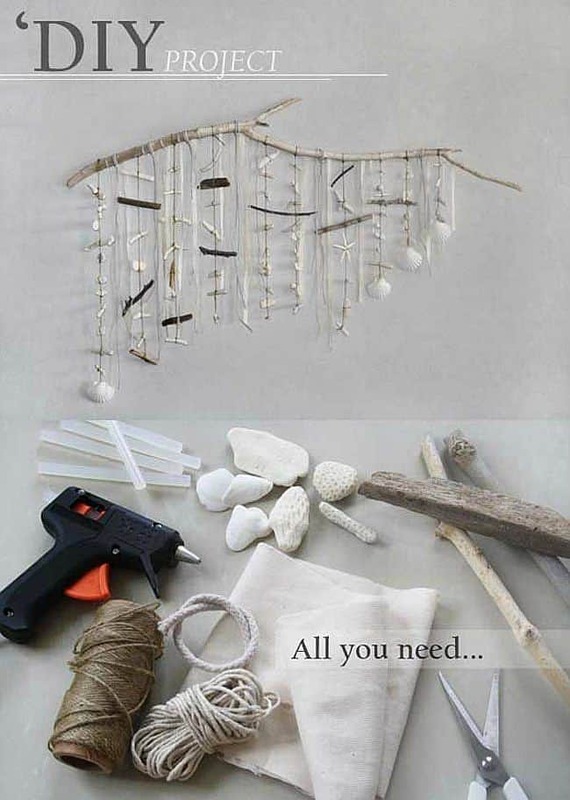 We love how whimsical this seashell and driftwood design looks. 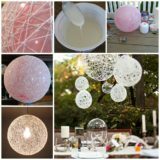 Doodlers Anonymous has a great idea for very artistic decor enthusiasts who are willing to really commit to their hobby or passion. 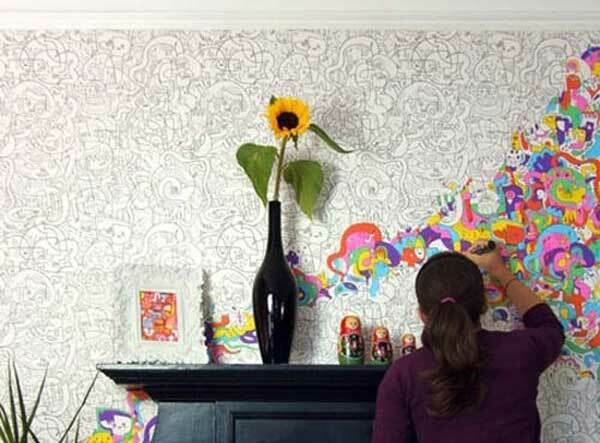 Black and white patterned or graphic wallpaper gives you an ongoing project because you can pick up markers or felt tipped pens and get to colouring right on the walls whenever you want! 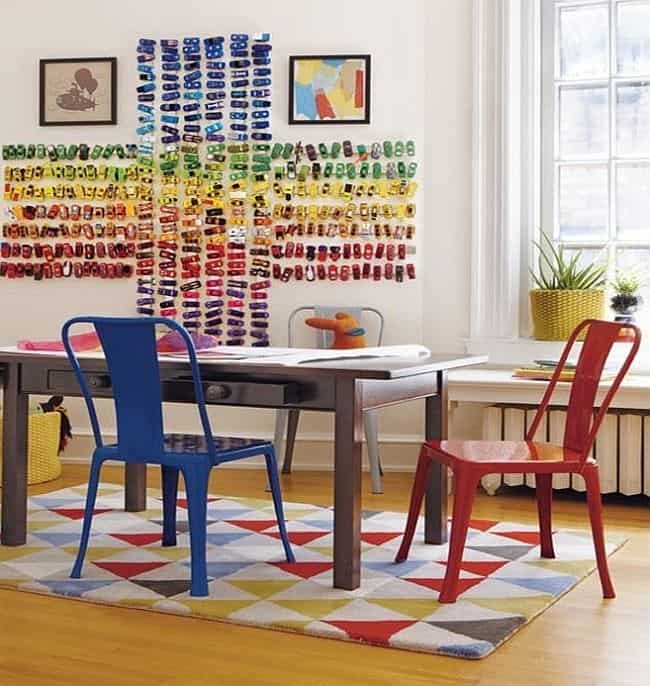 Kids will adore this decor idea. 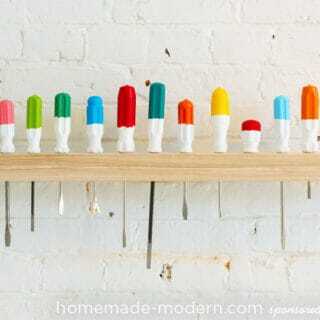 Do you love decor ideas that let you use household wares in unconventional ways? 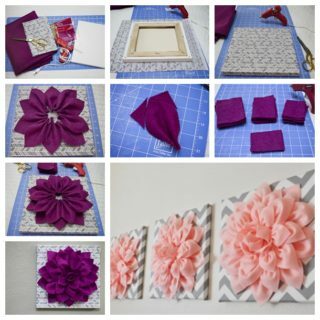 Shelterness has a great wall decor tutorial for you! 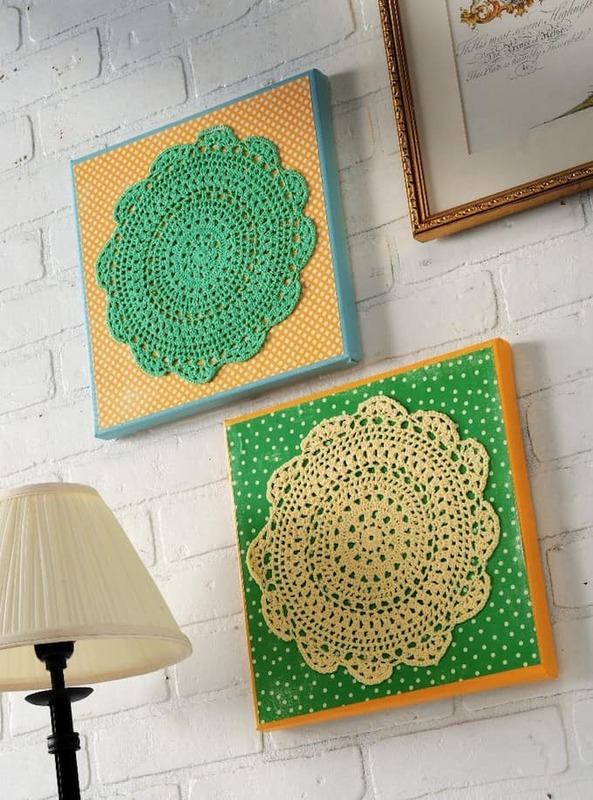 We love the whimsical, almost pop art aesthetic that using cupcake doilies of different sizes on the wall creates. 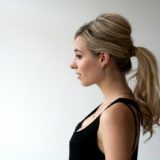 Are you a nostalgic person who loves to take photos? 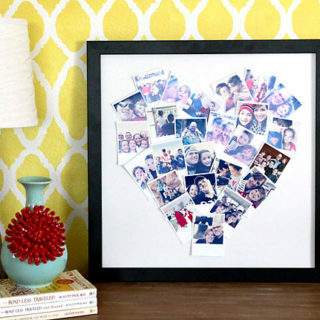 From The Right Bank suggests going all out and creating a complete collage wall from printed photos that mean something to you or remind you of happy times. 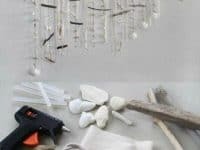 This project might be a little too much for the central rooms in your home, but we love it for a studio or recreation room. 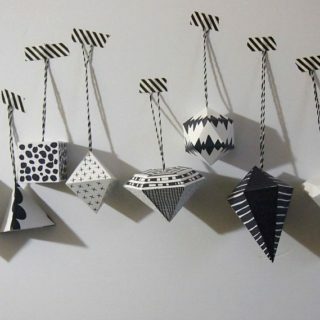 Apartment Therapy suggests using decor pieces that are actually meant to hang on your ceiling as wall pieces instead. 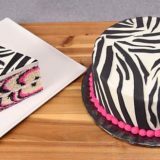 This tactic creates a look that shakes things up just a little bit but still makes visual sense. We love these bright painted ceiling sconces arranged across a blank wall in the main room. 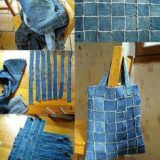 BHG knows that many people are fond of canvas are of all kinds. 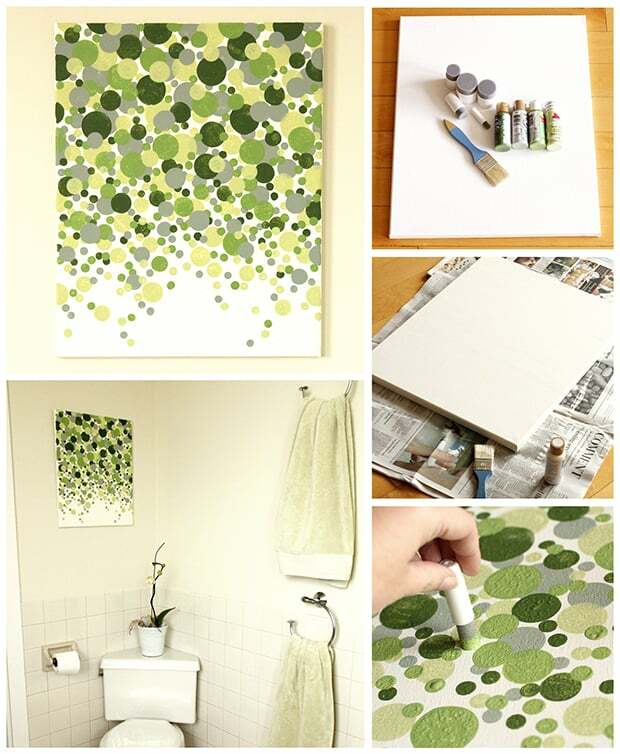 Working with canvasses also makes DIY projects much easier. Instead of just painting on a canvas, try working with 3D and textured mediums like twine and buttons to really draw people’s eyes when they walk into the room. 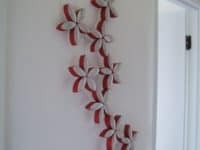 This particular decor project is perfect if you’re repainting all of the walls in your home, especially if you’re using many different colours that come in cans of different sizes. 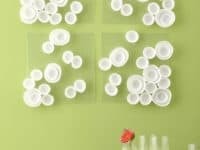 Follow this tutorial on BHG and, instead of throwing out the round lids for your cans when you’re done painting, dip them into whatever paint is left, let them dry and hang them on the wall like a colourful mosaic or trail. 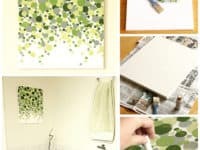 Tasty Tidbits and Random Rambles reminds you how pretty DIY decor can look even if you make it from something as simple as recycled cardboard toilet rolls. 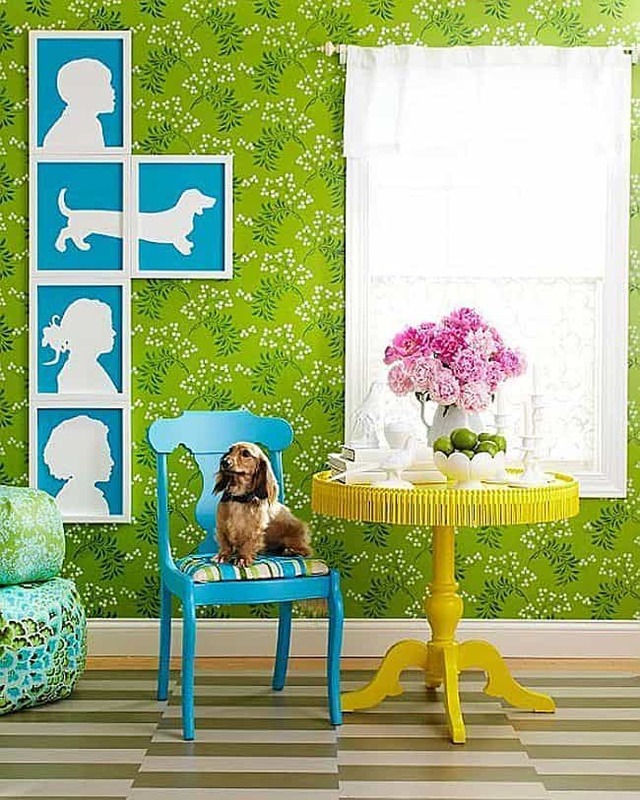 This design creates a cute, raised aesthetic that adds a bit of texture to your walls. 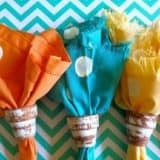 You can give the look some colour too by painting around the outside surface of each “petal”. 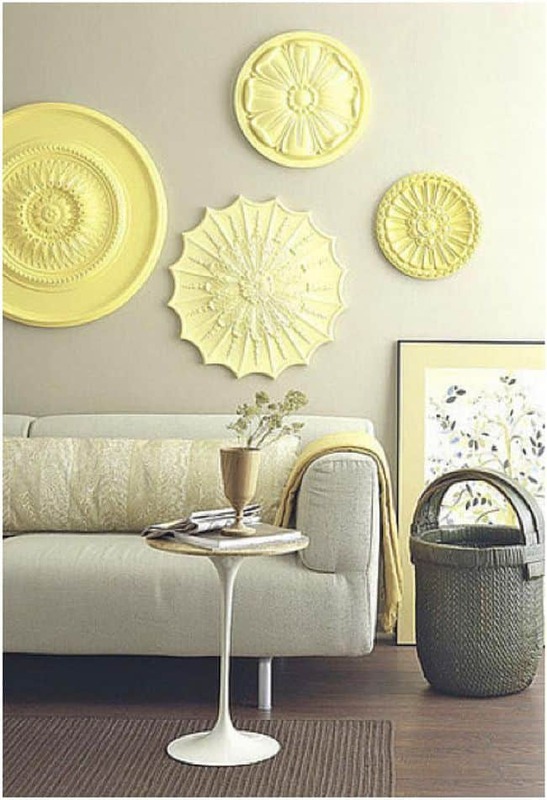 Okay, so we did give in and choose one classic paint and canvas piece in this wall decor list. How could we resist, though, when this dotted circular ombre design is so pretty? 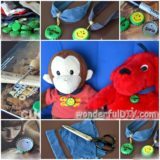 Check out how it’s made on Dabbles & Babbles. 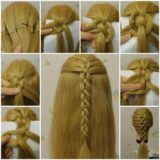 This idea might be our favourite one on the whole list! 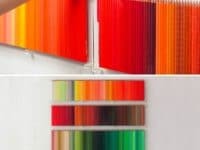 Follow in Wired‘s footsteps by creating a rainbow colour gradient wall hanging made from coloured pencils slid down vertically behind plates of plastic. 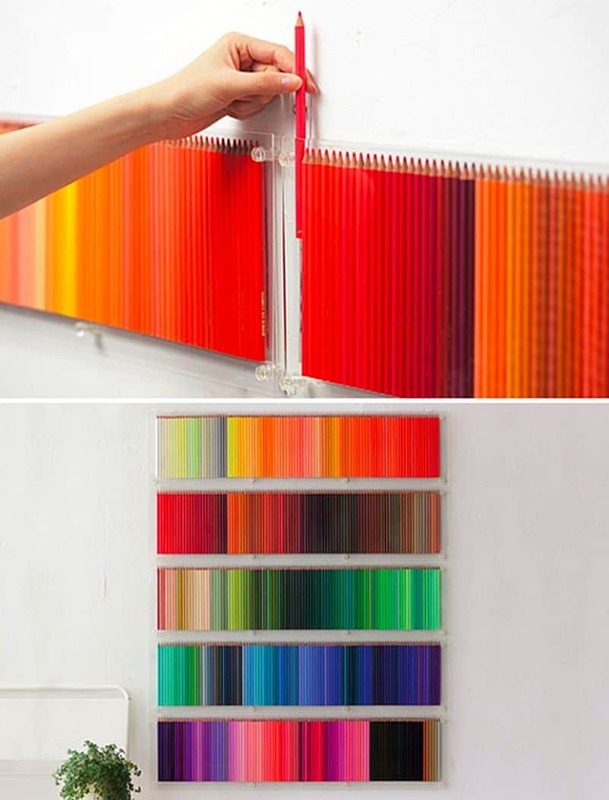 This would look perfect in an art studio! 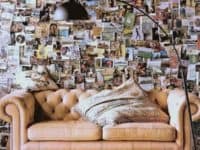 Are you feeling a little more artsy above and beyond just collaging things and attaching them to your walls in unique ways? 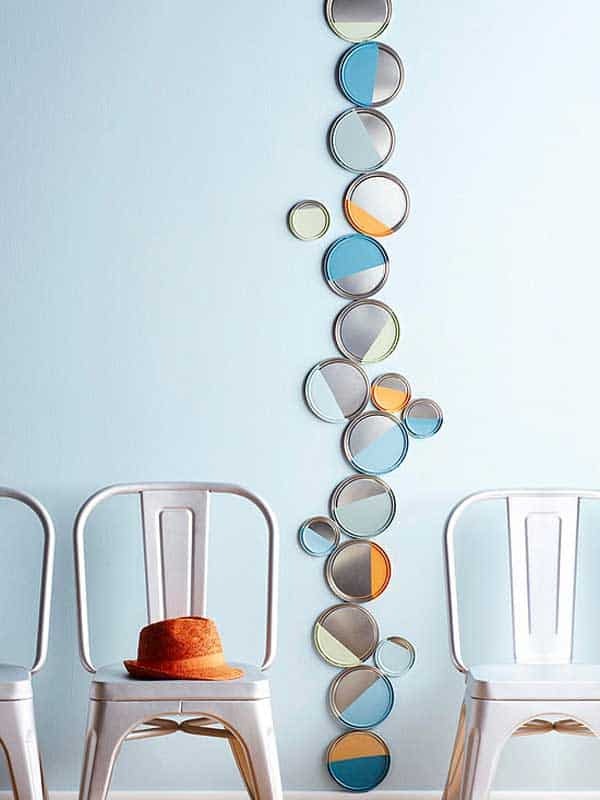 Try creating a family silhouette wall, just like this one from BHG! 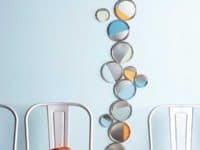 Have your family members sit between a bright light and a blank wall so that their side profile is reflected on the wall, trace around it, and use that to create this clean, modern art. Are you an avid music fan with piles and piles of albums sitting in a corner? 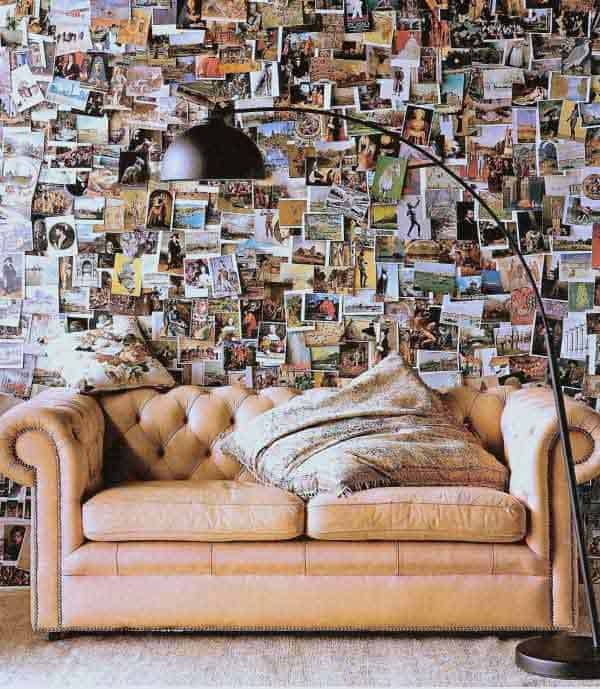 Do you love the idea of covering the entire wall like the photo design, but you’re not particularly nostalgic? 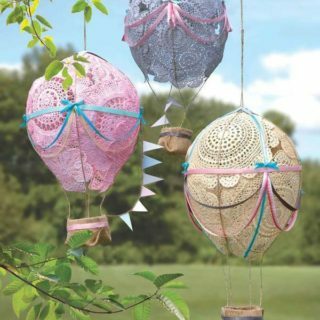 This idea from Devitant Art might be just what you need! 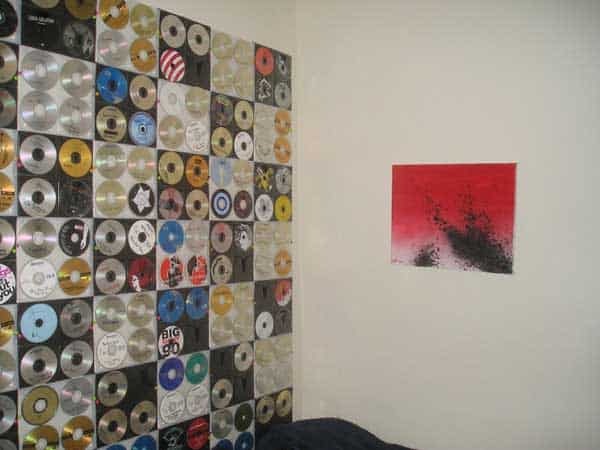 Covering an entire wall with encased CD albums lets people know how passionate you are about music the second they enter the room. 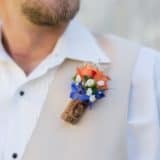 Are you look for unconventional are that’s a little more crafty and interesting to make than some of the other ideas here? 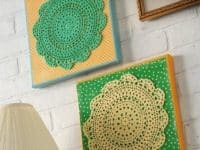 Upcycling old lace doilies into coloureful wall squares following the tutorial on Mod Podge Rocks! 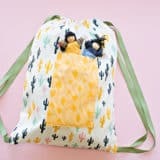 We love how beautifully kitschy the finished product is. 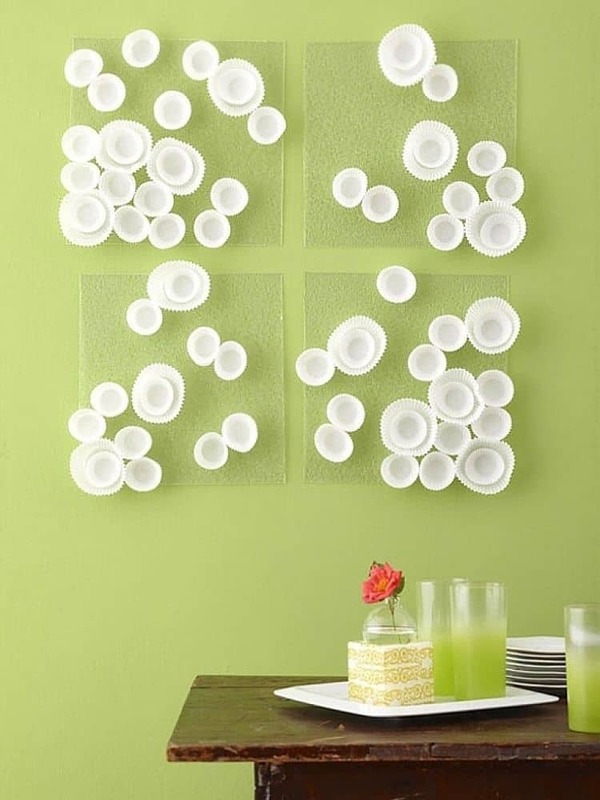 Which of these quirky and inventive wall art ideas do you love the most?